This post is part six in a series of blog posts celebrating 125 years of the BERNINA company. Each post will bring you a little more of the history of BERNINA, as well as modern inspiration. 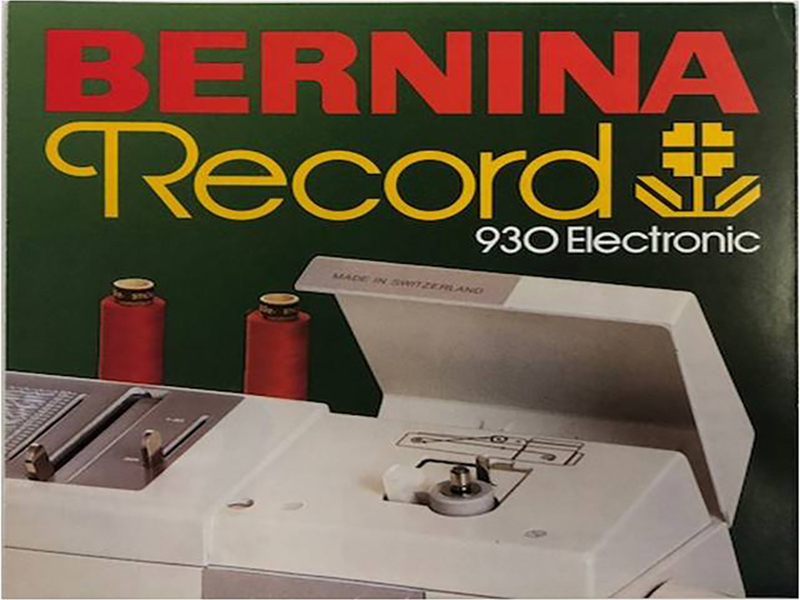 As BERNINA continued to drive innovative thinking, the company launched the BERNINA 930 in 1982. The BERNINA 930 had an especially powerful engine, and was the first model with a stretch stitch. 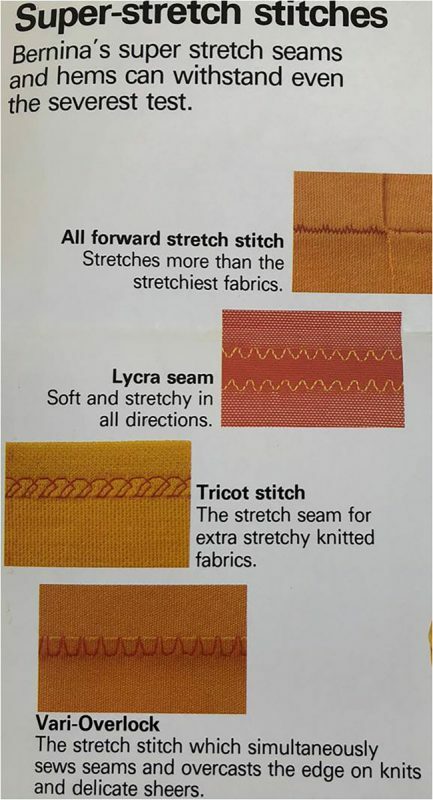 The stretch stitch was particularly important for garment sewing with knits and stretch fabrics. 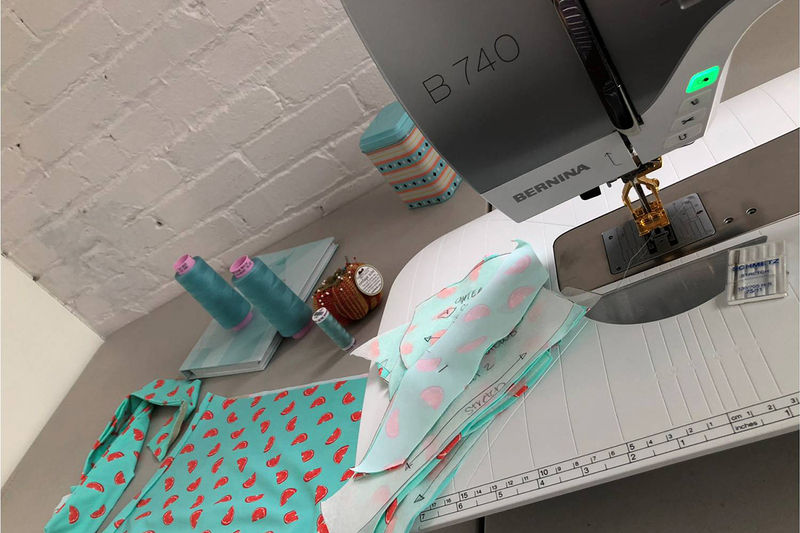 Learning to sew on a BERNINA machine is truly a remarkable experience, and it was that experience that made it easy for me to fall in love with sewing and made me a fan of BERNINA sewing machines. I later became an employee of a local BERNINA dealership, and now I have a position as a full-time BERNINA of America educator. While working in the store, I got to know a lot of the older model machines that people brought in for service, classes and sometimes for trade. I quickly learned that the BERNINA 930 Record was an all-time favorite and beloved machine, and understandably so. 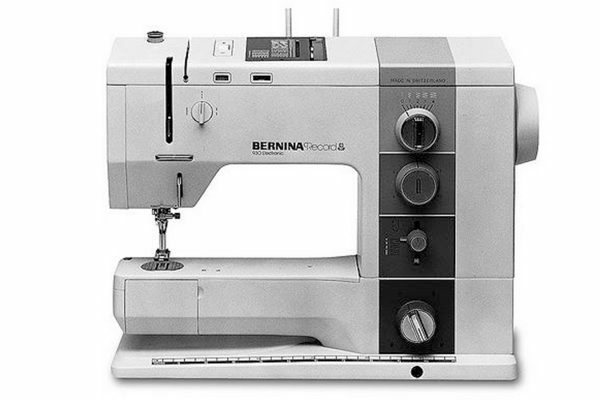 This machine is often referred to as a workhorse, and it was the model that BERNINA’s industrial machine was based on. The dealer that I worked for had saved old brochures from past machines. I loved looking through them and reading about the features and history of BERNINA through the years, machine by machine. 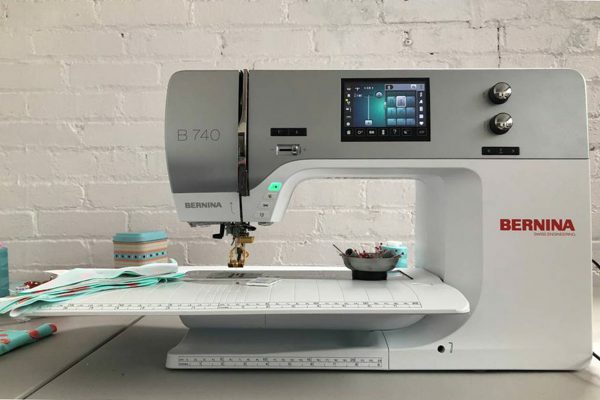 The BERNINA 930 was packed with so many new features and innovations it is easy to understand why people still seek this machine today. The DC motor is what makes our BERNINA machines so strong and smooth while sewing. I am not an engineer, so I can’t explain it scientifically, but DC means direct current, as opposed to AC or alternating current. The DC type of motor offers strong piercing power through thick or thin materials without falter. 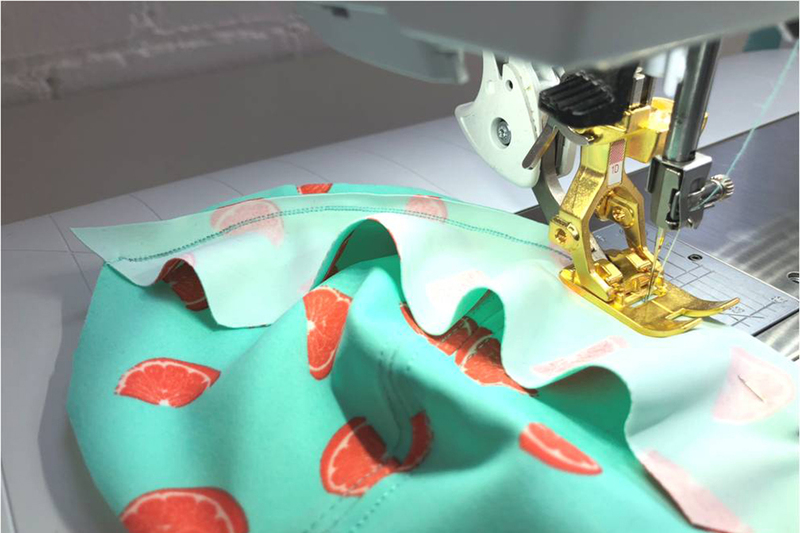 It also enables stitch-by-stitch control which further enhances the precision of sewing, and we all love that. 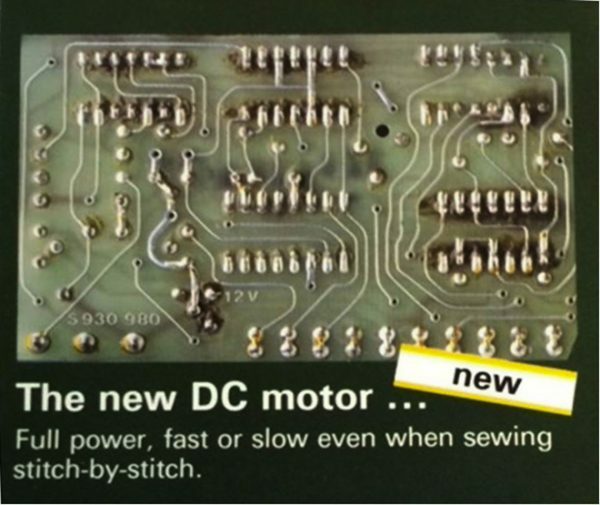 The innovation continues with this motor, as BERNINA has recently incorporated a DC motor into the BERNINA L 460 Overlocker. Having this type of strong precise stitching on an overlocker is truly a game changer. On today’s machines the super stretch stitch looks like a lightning bolt when sewn, with a narrow zigzag that steps backwards slightly. This stitch can actually stretch without breaking! As a BERNINA educator, I am the coordinator of the BERNINA Capsule Club. This club is part of the BERNINA SEW-cial Club program that is available at participating BERNINA dealers. In one of my BERNINA Capsule Club lessons this year, the topic was swimwear, and the super stretch stitch was the perfect stitch to showcase. Since then, I have become slightly obsessed with sewing swimsuits and decided to revamp a purchased one-piece suit into a bikini. This suit was super cute, but wasn’t really long enough for my torso. So turning it into a two-piece suit using my new-found stretch stitch sewing skills seemed like a good plan. 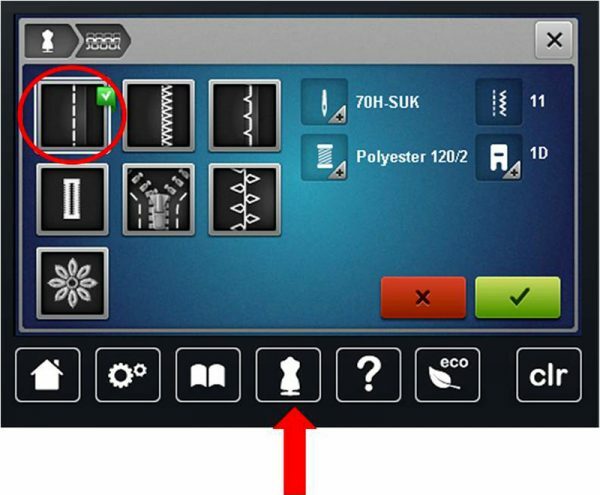 BERNINA has continued to offer new and innovative features to their machines year after year. For my swimsuit revamp I used the BERNINA 740 machine. This machine is a garment sewists dream. The 10” throat to the right of the needle provide lots of space to work, and the jumbo bobbin is nice too. Two of my favorite machine features for this project were Dual Feed and the built-in Creative Consultant program. 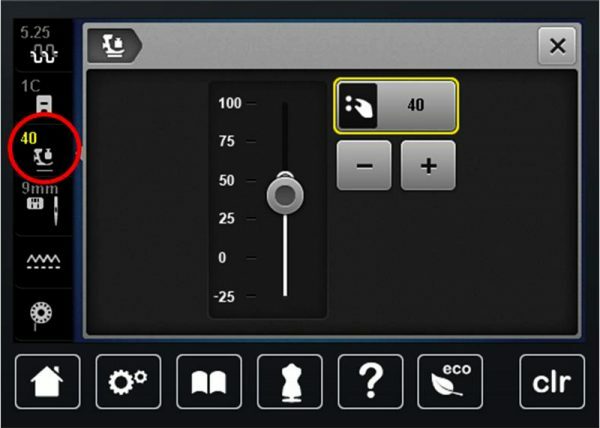 The BERNINA Creative Consultant is a built-in menu on our computerized machines that provides helpful tips and technique settings for specific textiles and sewing techniques. Select the Creative Consultant icon (looks like a dress form), and then select the textile you wish to work with. If you have trouble remembering what the textile icons stand for, you can touch the Help (?) icon and then touch the textile icon. It will display a written description of the textile. I selected Light Weight Knit as the fabric type, and then selected Seams in the techniques screen that opened. 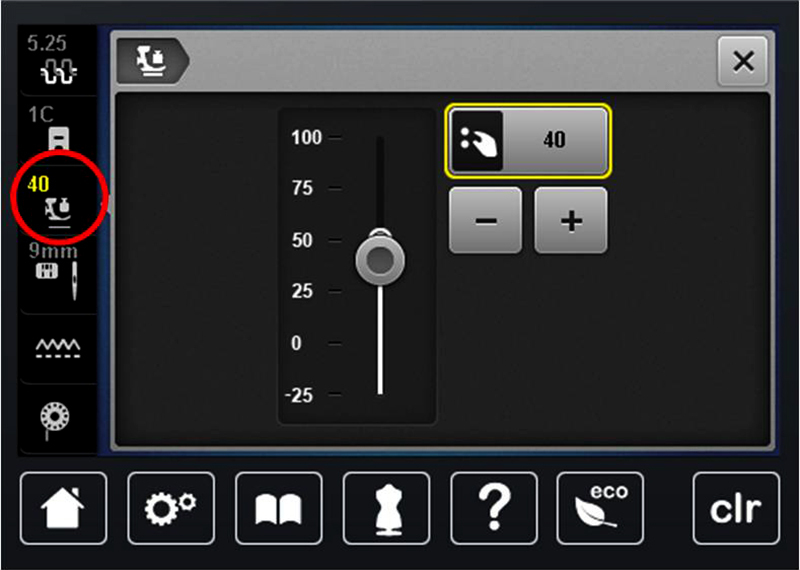 The information shown on the right side of the screen includes suggested needle type, thread, stitch, and presser foot. 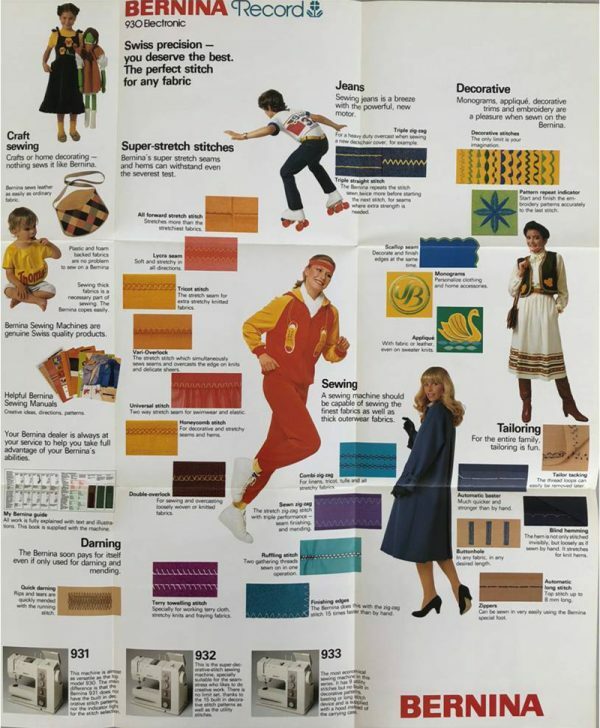 For light weight knits (such as Lycra), the Creative Consultant recommended Stitch #11 Super Stretch Stitch, and the Reverse Pattern Foot #1D. Of course I used polyester thread as suggested, and a stretch needle (SUK), which is my personal preference. 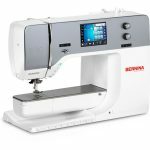 BERNINA Dual Feed is a built-in upper feed system that works with any of the BERNINA D-feet. This feature is like having a walking foot with multiple presser feet options. Sewing knits is a challenge because they stretch a bit as you stitch. Lycra is also extra slippery, so having the additional feed from the BERNINA Dual Feed helps the layers stay together. Dual Feed, combined with the new BERNINA Adaptive Thread Tension, made easy work of sewing with the Lycra. BERNINA Adaptive Thread Tension is a new innovation added to the 7 Series machines in which the tension is electronically adjusted to the selected stitch width, length, machine speed and needle position with each stitch that is taken. 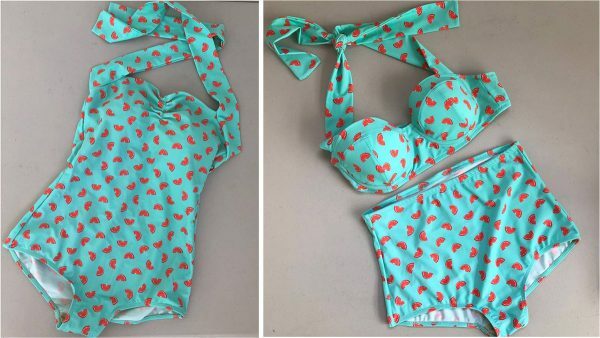 I was able to cut apart my existing swimsuit into the correct size pieces for the top of the Sophie Swimsuit by Closet Case Patterns. I recently made this pattern and love that this top has underwire support and foam padded cups. For this type of detailed and challenging sewing, I would also recommend the 9mm Stitch Plate with 5.5 mm Needle Hole. This plate does not come standard with 9 mm machines, but I find it essential for sewing garments. The standard 9 mm stitch plate has a large opening that is great when you need a wider stitch width, but for this type of sewing, the fabric wants to sneak into the extra space and that can create a lot of unnecessary challenges. Like any sewing, it is all about having the right tool for the job. On this machine you can also adjust your presser foot pressure. I have learned that when I am sewing something really stretchy such as Lycra that lowering the presser foot pressure from 50 down to 40 will help keep the fabric from stretching out as it is sewn. 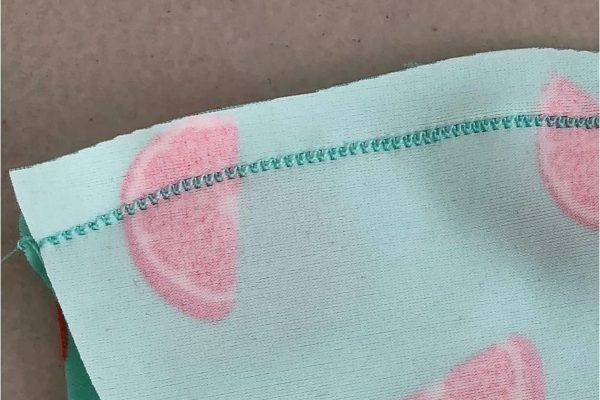 This stitch works perfectly for this seam. I bought the Bernina 930 in 1982 not long after I graduated college, paid $900.00 and it came with a free cabinet. I paid it off in three months with money I made from sewing. I replaced the motor twice after it caught fire. I finally parted with it in 2005 and bought a 440 QE which I have used to make many competitive designs for clothing and quilts. There’s nothing like a Bernina! I can not agree more! You have some of my favorite machine models ever made. Thanks for being a loyal BERNINA user and fan. The upgraded motor on the L460 is a DREAM! It is so nice, right?! I purchased my 930 in 1983, and thought it was the most spectacular machine I had ever used for that time! As I was making clothes for my three sons, I just loved to hear it purrrr, and appreciated so much that it had such precision. In 47 years of using Bernina top-of-the-line machines, it is still one of my favorite models. Sounds like that machine served you well! It is a special model indeed. I still have my 930, purchased in the early 80’s. 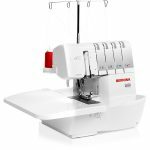 It changed my sewing life! I now own 4 more Bernina machines and have gifted 3 more recently to spark sewing interest in some of the younger generation among family and friends. There’s nothing like sewing on a Bernina! I love hearing this story! I feel the same way about my first BERNINA and feel really fortunate to have my experience learning to sew to be on a great machine.